MEITAR (an oblique hebrew reference to stringed musical instruments, particularly the harp) is an orchestra which is B’H poised to take the current standard of celebration to the next level and beyond. MEITAR is a revolutionary phenomenon. 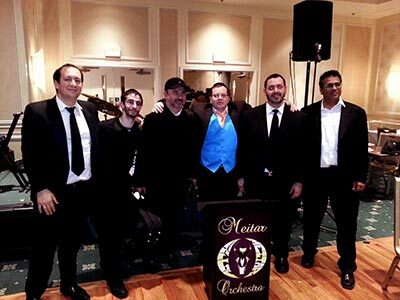 MEITAR will strike a rich, resonant chord of satisfaction with every party planner, party host or Baal Simcha looking to equip their event with the very best talent at the most competitive price. Meitar was conceived, created and carefully planned to offer every possible party-related service to every level of consumer, ranging from the most elaborate to the more economically minded. Meitar’s repertoire is vast and complete,comprising the finest musicians, state-of-the-art sound systems, and popular entertainers. All this talent can be easily accessed with just one short phone call or click of a button! These excellent services are offered at competitive prices and are backed by Meitar’s un swerving commitment to your complete satisfaction. Meitar is the brainchild of its founder and CEO, Menachem Tzvi Roseman. Mr. Roseman is a professional drummer, percussionist and trained sound engineer. His ear for music is exceptional; his passion for high quality music, phenomenal. And it is this search for excellence that has prompted him to create a new orchestra, Meitar, which consistently seeks the very best talent available. Mr. Roseman’s musical talent encompasses a second facet in that he instinctively knows which musicians interact best. An orchestra created by Mr. Roseman is a quality musical product; one sure to please and impress! Meitar Orchestra - the celebration sensation! Give us a call and book your event today! Copyright © 2019 Meitar Orchestra Inc.